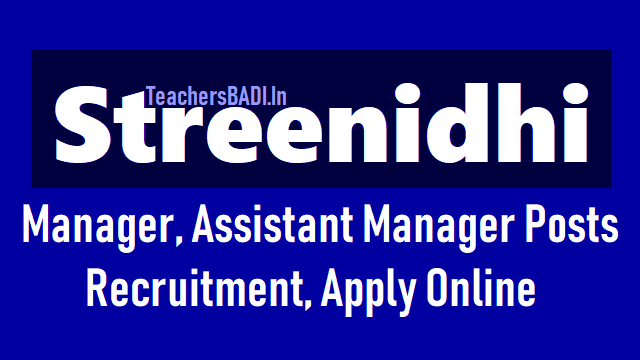 Streenidhi Manager, Assistant Manager Posts 2018 Recruitment: SERP Telangaa, Stree Nidhi Credit Cooperative Federation Limited, Department of Rural Development: Government of Telangana has given the Manager & Assistant Manager Posts Recruitment 2018 Notification in 'STREE NIDHI' and applications are invited the from the eligible and interested candidates for appointment of Managers and Assistant Mangers in Stree Nidhi. The selected candidates for the post of Manager are required to work in any district(s)/Revenue Division/Mandal allotted to them in the state, and where as the selected candidates for the post of Assistant Manager are required to work in any Mandal(s) allotted to them in native district concerned. The state wise details of vacancies for the post of Managers (Social category and gender wise) are provided in Annexure -I. The district wise details of vacancies for the post of Assistant Managers (social category and gender wise) are given in Annexure II. The nature of job profile of all the above posts are given in Annexure III. Experience · 2-3 years experience in working with Federations of SHGs/Financial Institutions/ Micro Finance Institutions/ Community Based Organizations/ NGOs or any other relevant experience. Posting · Posting will be in any District in the state at Mandal/Revenue division head quarter and transferable anywhere in the state as per administrative exigencies. · Candidate must stay at their allotted headquarters only. Qualifications · Bachelor Degree from any recognized University in India established or incorporated by or under Central Act, Provincial Act, a State Act or an Institution recognized by the UGC or an equivalent qualification with minimum 50% marks for OCs · Relaxation of 5 % i.e., 45% marks in case of BCs · Relaxation of 10% i.e., 40% marks in case of /SCs/STs/PHCs · Candidate must possess the required educational qualifications has on 31.03.2018 and possess degree certificate · If a candidate has any proficiency in computers, a certificate in support of the same should be uploaded. Experience i. For Candidates from women SHG members: · Candidates should be a women SHG member of a SHG registered with SERP/MEPMA and should have completed a minimum period of 6 months as on 31.03.2018. ii. For Candidates from MS Accountants/ Computer Operators/ Village organization Assistants (VOA) of Village organization/Resource Persons (RP) of Slum Level Federation. · Knowledge in functioning of SHGs and their federations (SHGs/VO/SLF/MS/TLFs) is essential. Requirements Must own a Two wheeler or should acquire the same within 3 months of joining. Must possess a valid driving license or should be willing to possess the same as on the date of posting or within a period of one month from the date of joining. The eligible candidates to apply for vacant positions in their native district only. Candidates will not be posted in their native Mandal and will not have their native Mandal as area of operation. Candidate must be willing to work anywhere in the district. Must be willing to tour for a minimum period of 20 days in a month. In case candidates from SHGs, if selected, the candidates shall withdraw their membership from the SHG concerned/resign from present post. Selected candidates must stay at their allotted headquarters only. * Managers and Assistant Managers are eligible for TA and DA while on tour as per the guidelines in force. The Salary amount mentioned in case of Manager and Assistant Manager posts will be in the form of Basic Pay, Special Allowance, HRA, CCA, PF (both employee and employer contribution) subject to place of posting. The Selected candidates shall be covered under HR policy of Stree Nidhi. There will be a regular performance review and Stree Nidhi has discretion to terminate his/her services if the performance is not found satisfactory. Candidates to note that this is not a Government Job and will be on contract basis and it is not on permanent basis. The selected candidates will be on probation for a period of 6 months and on successful completion of their probation, they will be taken on contract basis for 5 years as per the policy of Stree Nidhi. However, the Contract is renewable on yearly basis, depending on performance. 1. Rule of reservation in recruitment will be followed. 2. In case of candidates who have completed both Graduation and Post Graduation, highest marks secured in any of the above qualification will be considered for shortlisting the candidates for written examination subject to securing 50% of marks in Graduation. 3. The eligible/shortlisted candidates will be called for written exam in a ratio of 1:15 or actual which ever is less on the basis of merit. 5. The selection of candidates for the post of Manager and Assistant Manager will be based on marks secured in written exam and Group Discussion. For CBO staff viz. VOAs of Village organization/RPs of Slum level Federation/MS -Accountants/Computer Operators/Zilla Samakhya-Accountant/Computer Operators who are eligible shall upload a certificate issued by President/Secretary of MS/TLF/ZS and Staff of Stree Nidhi concerned in the proforma enclosed in Annexure IV. While applying for Assistant Manager Post under women SHG category, the member details have to be validated and obtain a unique registration number for completing application filling and submission process. Shortlisted candidates will be informed one week before the written examination by SMS alert and through e-mail along with venue, date and time of examination. Hence, the candidates are required to give correct e-mail ID and mobile number. Duration of exam will be 1 hour 30 minutes. No TA/DA will be paid for attending the written exam/group discussion. Written exam for Managers/Assistant Managers consists of objective type for 65 marks and descriptive type questions for 10 marks and comprehension for 5 marks and 20 marks for Group discussion. The examination will be different for Assistant Managers and Managers. The examination will be conducted for Assistant Managers/Managers on the same day in forenoon and after noon. Written exam will be on Current Affairs, General Knowledge, General English (10th Class standard), Arithmetic and Reasoning, SHGs & their federations and basic Knowledge on computers etc. Exam will be conducted at Hyderabad only. Medium of examination will be in Telugu. documents viz. educational qualifications, caste, nativity, Aadhaar, PAN Card, PHC certificate if applicable. While applying for the post, the applicant should ensure that he/she fulfills the prescribed eligibility norms and the particulars furnished are correct in all respects. In case if it is detected at any stage that a candidate does not fulfill the eligibility conditions or that he/she has furnished any incorrect/false information or has suppressed any material fact(s), his/her appointment will automatically stands Candidates with criminal back ground/disciplinary proceeding are not eligible to apply. Mere submission of application against the advertisement and apparently fulfilling the criteria as prescribed in the advertisement would not bestow on them any right to be called for written exam. Once the women SHG member is appointed in Stree Nidhi, she will not be eligible to continue as member in SHG and avail the financial services from Stree Nidhi. The Managing Director, Stree Nidhi reserves the right to keep in abeyance or cancel the recruitment at any point of time without assigning any reason.